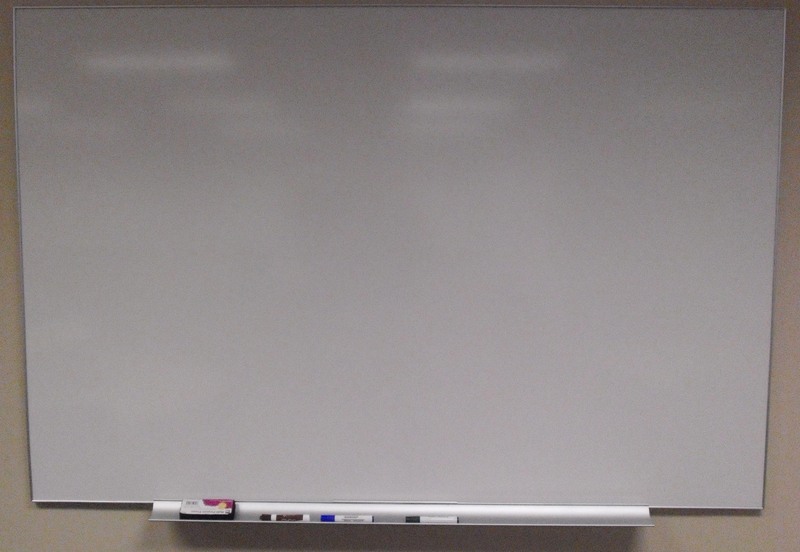 Student teams use dry erase surfaces in the active learning classroom for brainstorming, problem solving, diagramming, and other group activities. They are one of the most "low tech" pieces of equipment in the room, but also have the flattest learning curve. Eight Steelcase ceramicsteel™ whiteboards cover the majority of the classroom's walls. 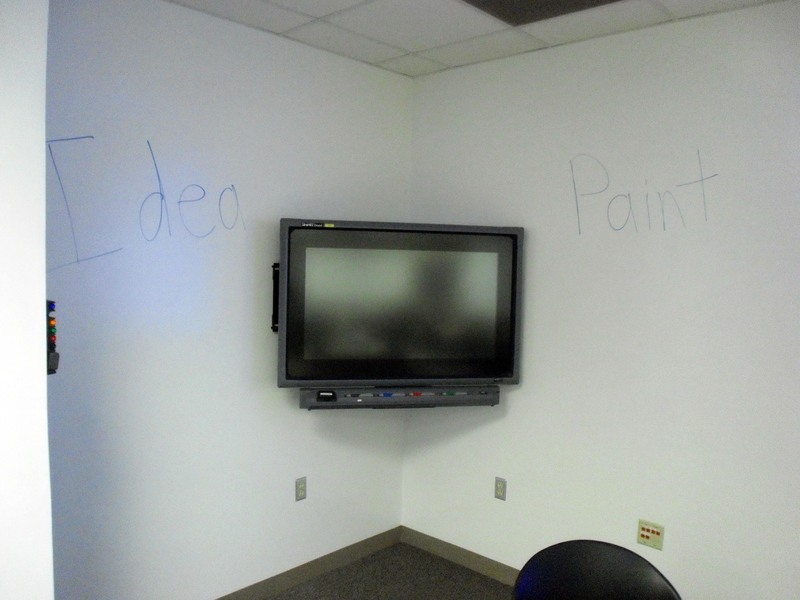 A dry erase whiteboard paint called IdeaPaint™ was used to turn the wall itself into a dry erase surface in the room's southwest corner. Due to a pillar in this corner, it would have been difficult to hand traditional whiteboards in this space. 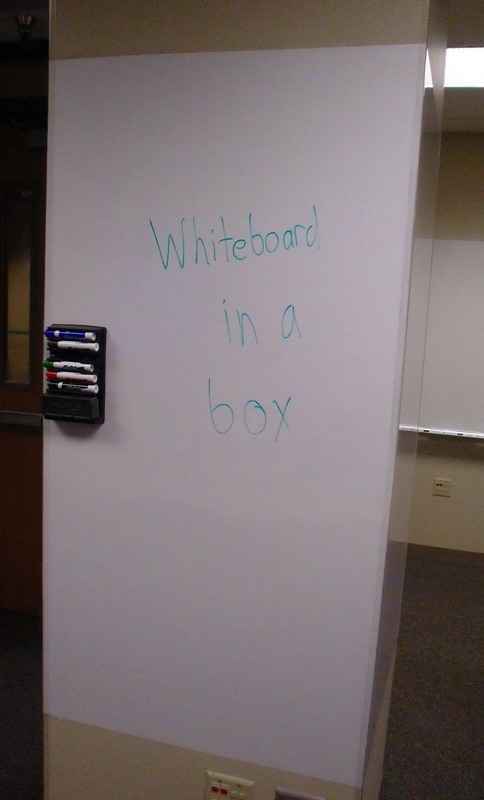 NMU considered using IdeaPaint throughout the room, but because it had not been used at NMU before decided to evaluate it in a smaller area. After the room was nearly complete, the project team realized that one table had insufficient dry erase space when the projection screen was pulled down. This table was situated near a large square pillar, but at that point it was too late to paint the pillar with IdeaPaint. Instead, two sides of the pillar were covered with a self stick dry erase material called Whiteboard in a Box™. This product comes in a roll and is applied like wallpaper, but the sticky backing is not a permanent adhesive so the writing surface can be adjusted or removed.